Finally, I have found the time to review the highly anticipated Clio All That Eye Styler Kit 1 - Lie on the beach that I bought in my 15th Gmarket order. I cannot believe how I was able to hold off from testing it out for about a year, but being too busy and tired helps. ^_^; The eyeshadow shades of the Clio All That Eye Styler Kit eyeshadow palettes are really made for the summer, so I had to take them out and play with them. Let's see how the first eyeshadow palette is like. The Clio All that Eye Styler Kit 1 - Lie on the beach has a metallic green tin with a pretty, colorful graffiti print on the cover. 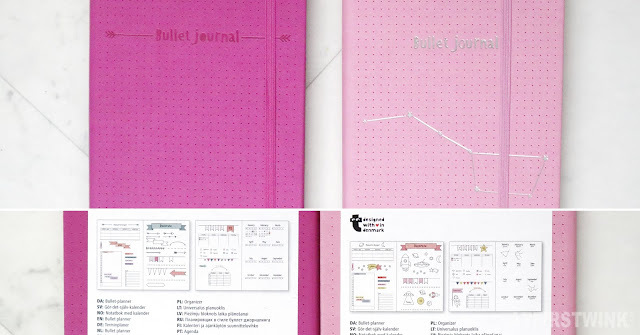 The measurements are: 15 x 5 x 1.5 cm and it is small enough to carry around in your bag. 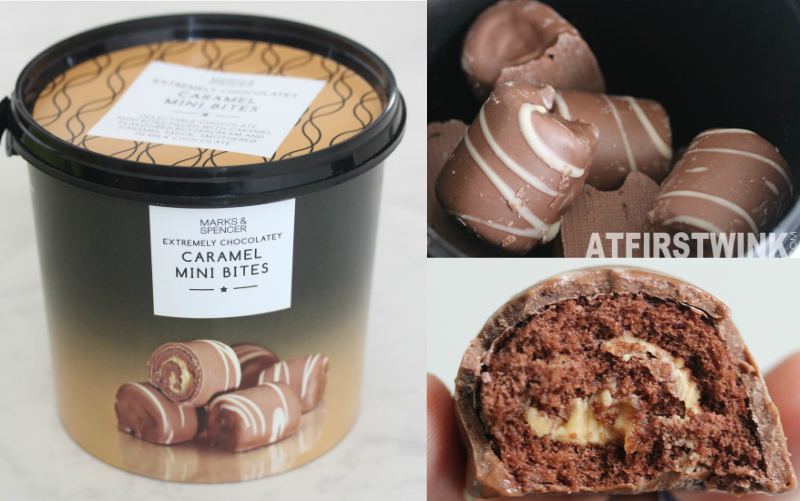 The lid also closes very tightly, without being too difficult to open. The black interior looks like it is made of some kind of sponge, but it is made of plastic with a grainy surface. It is very easy to clean with a damp cloth. The brush that is provided has two ends: a brush and a sponge applicator. The sponge applicator part is very fragile and it came off when I took the brush out of the plastic foil. The brush hairs on the other hand are very soft and you can apply eyeshadow with it with great precision. The sponge applicator is still very needed to blend out the eyeshadow, so I just had to put it back in the brush. This task was surprisingly easy. I am however unsure how well it is going to hold up. There is 0.7 g of eyeshadow in each pan. 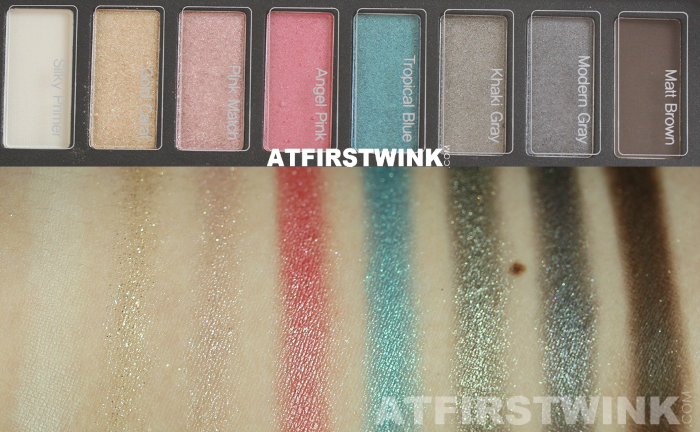 The names of the eyeshadow colors are (from left to right): Silky Primer, Gold Carat, Pink Match, Angel Pink, Tropical Blue, Khaki Gray, Modern Gray, and Matt Brown. I have swatched all 7 eyeshadow colors without the primer underneath to show you how they are on its own. Compared to the swatches from Clio, Gold Carat and Pink Match are a bit less pigmented and the Angel Pink color has turned red due to the brush cleanser, but even without that effect, the pink color has more red tones than the bright pink in the swatch pictures from Clio. The rest of the colors are quite accurate. The pigmentation of the eyeshadows increase in the order from left to right. Just to be clear, the Matt Brown color doesn't have any glitters. The brush still had some glitters on it, when I swatched it. The silky primer is quite nice, but it doesn't apply very smoothly, so I rather stick to my own. I mainly bought this eyeshadow palette for 4 colors: the Angel Pink, Tropical Blue, Khaki Gray, and Modern Gray. So I could not wait to try them out. All eyeshadows were applied without any primer underneath. Khaki Gray has a very pretty sheer grey color with a hint of Khaki green. Modern Gray is a icy blue shade with hints of grey to tone it a bit down. 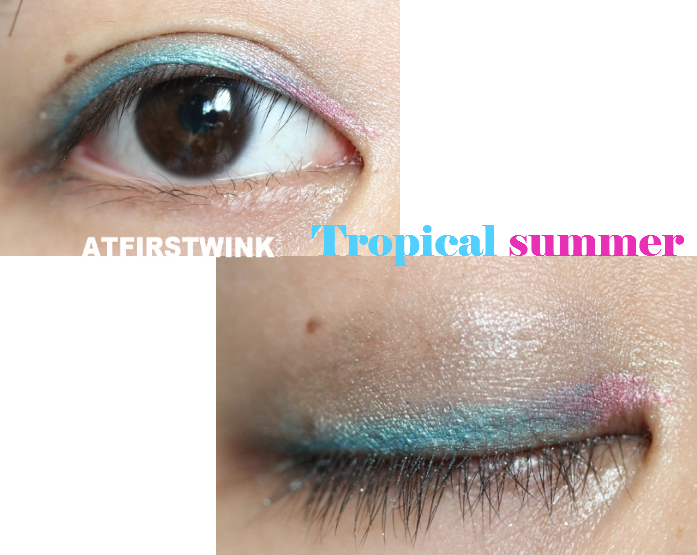 Lastly, I have a bonus Tropical summer look for you that I had created using Khaki Gray (very lightly on the whole eyelid), Tropical Blue (as an eyeliner), and Angel Pink (in the inner eye corner). I think that the Clio All that Eye Styler Kit 1 - Lie on the beach is already worth buying for the 2 shades: Modern Gray and Khaki Gray. You can wear them lightly, as well as highly pigmented with a primer underneath. The Tropical Blue and Angel Pink color also look great together and you get an instant summer look with them. Sadly, I already have something similar (the green eyeliner from the Mizon Parisien Eye Stage Collection mini eyeliner set and the Etude House xoxo Minnie Look at my Eyes Jewel PK006), otherwise it would have been a great addition to my otherwise plain eyeshadow collection. The shimmery gold & pink and the matte brown shade are basics that most people should already have, but they are great to take along with. You can add them on top of your current eyeshadow to add a touch of glitter or go from a day to night look with them.